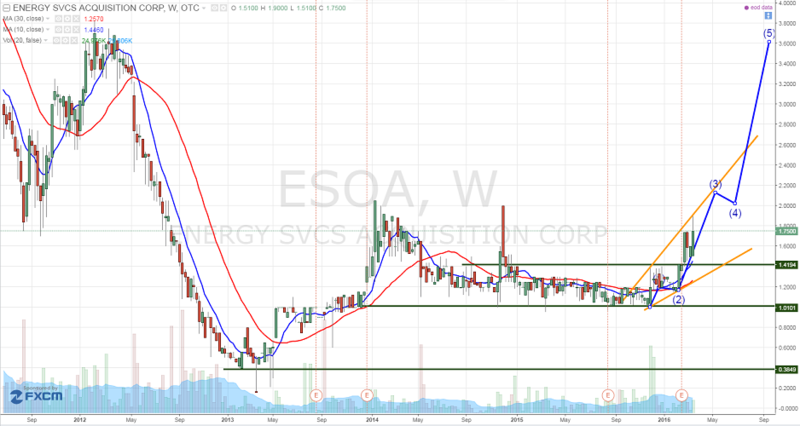 Energy Services of America Corp. (OTCMKTS:ESOA) has been steadily rising since the beginning of the year on a slew of exciting developments. The stock has gained over 50% and close to surpassing its 52-week high of $1.90 and currently trading at $1.74. Energy Services of America Corp. (OTCMKTS:ESOA) reported a fantastic 2015 year. Revenues increased by a whopping 25% or $23.5 million to $116.8 million for FY2015 from $93.27 million FY2014. Operating income surged by 111% or $2.4 million to $4.3 million for FY2015 from $2.2 million for FY2014. EBITDA climbed by 36% (or $2 million) from $5.4 million to $7.57 million. EBITDA per share for 2015 was $0.53 compared to $0.39 the year prior. From a technical chart perspective, Energy Services of America Corp. (OTCMKTS:ESOA) has broken above its 10 and 30 weekly moving averages which is bullish over the medium and longer-term horizons. An even more bullish indicator is that the 10 weekly moving averages crossed above the 30 weekly moving averages (similar to the golden cross). As a result of this cross over, both moving averages are slopping upwards and the slope trajectory is increasing dramatically which is another bullish indicator. Energy Services of America Corporation is engaged in providing contracting services for energy related companies. The Company serves gas, petroleum, power, chemical and automotive industries. It has a share count of only 13.91 million shares which designates it as a small share float company. ESOA is currently trading at a $24.2 million market valuation. This company is on the verge of massive growth. Its backlog has grown significantly and continues to post incredible year of year comps. Yet, the share price still has yet to reach record levels despite posting big numbers. In addition, this microcap actually has positive earnings with a P/E ratio of 11.72. We will be updating on ESOA when more details emerge so make sure you are subscribed to Microcapspot so you know what’s going on with ESOA. Disclosure: we hold no position in ESOA either long or short at the publication of this article and we have not been compensated for this article.